January and February in this house means lots of garden planning. Last month the Worm Factory was set up to compost for us and this past week a small greenhouse went up. We are now itching to get to auctions and estate sales so we can grab up planters and to get seedlings going in the meantime. We have tons of heirloom seeds and lots of dreams AND fortunately for us our kids get just as excited about growing things as we do. They all want to help because a garden is magical. Childhood is a time of curiosity, exploration, and adventure. A garden of is one of those great mysteries of life that can bring wonderment and joy to our kids and it is such an educational experience for them. Not only are they able to have a hand in bringing forth new life, kids benefit from being involved in an outdoor activity that enhances their health and their appreciation for the natural environment and how we need to cultivate it. There are many children’s books on the market that incorporate gardening and child gardeners. What better way to get kids excited than for them to hear about other children and their grand gardening adventures. One of our favorites is The Curious Gardener. It is about a little boy living an industrialized city who finds a small tree growing near some abandoned train tracks. From that humble starting place he creates a grand garden that motivates the entire city to jump on the gardening bandwagon. Earth Tales gives children a global perspective as it shows many cultures come together with the goal of caring for their local environment and growing food. It also has several crafts for kids, like making a corn husk dolly. Sunflower Houses – LOVE this book!! You can use sunflowers to create a playhouse. Once the sunflowers grow to almost full height you take string and tie the tops together to form a “roof” then morning glories can be grown up the sunflowers until they reach the string and fill in the roof. The whole concept is outlined in this amazing book. Another winner is Roots, Shoots, Buckets, and Boots. Apple Pip Princess – The story is about a sad King whose land and heart have been barren ever since the death of his beloved wife. Concerned about the future of his kingdom he challenges his three daughters to do something important to make their mark and after 7 days the King will see what they have accomplished and decide who the next ruler will be. The youngest daughter decides to use a magical Apple Pip seed from her mother as the basis of her plan. Make a rainbow! Have the kids help you pick out flowers or herbs in the 6 different rainbow colors… red, orange, yellow, green, blue, and purple. Plant them in curving rows with gravel, pavers, river rocks between each row. When they bloom you will have a rainbow! Grow a functional very fun, Pizza Patch. Carve out a circular section for this one and divide it into sections or slices. In each section grow a different pizza ingredient like tomatoes, garlic, onions, oregano, basil, rosemary, etc. When harvest time comes go out together and gather your ingredients and make pizza from scratch together. Build a garden tee-pee. This is similar to the sunflower house in concept. You put wooden poles in the ground and angle them to form a tee-pee, tying them together at the top. Make sure it is big enough for kids to pay inside. Then plant vines like morning glories, beans, or gourds so that the walls will fill in with vegetation. Guide the vines at first to make sure that an entrance is left open for little bodies to crawl through. Create a fairy garden. This can be done indoors or out. For the outdoors, use twigs and sticks that have fallen from nearby trees to make fairy houses and furniture. Use tempera paints to give them color and texture. You can even use hollow nuts to make little boats and beds for them. For the indoors you can make a moss garden in a wide mouth pot or tray and if your kids have fairy dolls or gnomes this can be their new home. There are even complete kits that you can buy to make these easy. Children love to have their own tools. It really makes them feel like an important member of the family gardening team. There are plenty of children’s tools on the market, like this ToySmith Garden Tote with Tools. You can also scope out thrift stores, and yard sales to find regular tools and then personalize them with a fresh coat of paint in your child’s favorite color. Wildcraft – An herbal adventure games that helps the family to identify herbs and pinpoint their medicinal value. The Farming Game – My daughter adores this game and requests it VERY frequently, LOL. The gameboard is a working farm, with fields full of produce. Kids harvest the food to sell at their fruit stand. The player who gets to the Fruit Stand with the most produce that wins the game! 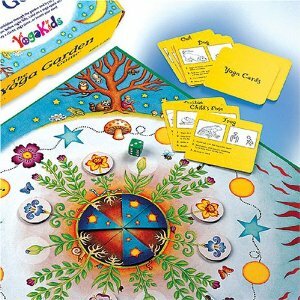 The Yoga Garden Game – A cooperative game where the objective is to plant a flower garden before night falls. As players move the bumblebee marker around the board, they learn classic yoga postures, as well as have the chance to invent their own!